@Scott-Przybylski I emailed you an updated version of it with dimensions that are as close as I could get to the ones that were provided. I don't know how to adjust the tiling on the road to make the road texture have shorter lines or what the triangle count is, or what LODs are haha so I left those alone but if you know of a good way for me to try and learn about those and how to do that I'll see what I can do. I had the flag acting as if it were cloth in a previous rendition but for some reason when I started messing with the dimensions, it stopped acting like it was. I tried adjusting a bunch of the settings for it but I couldn't get it to work right so I just took the physics out of it for now but if you'd like, I can try and go back and get it to work. I made it a little skinnier and added some textures. I just started using this program on tuesday so some of them aren't great. Feel free to make any more suggestions for me to work on. 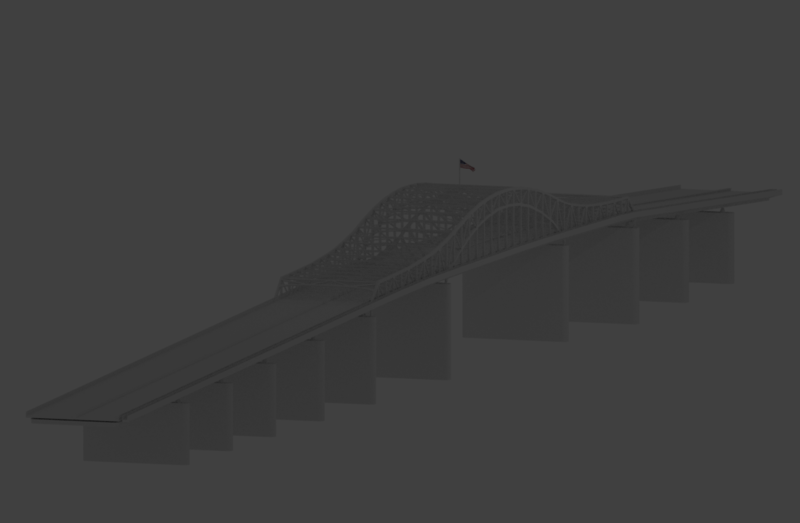 @Scott-Przybylski I've been working in blender on making a model of the Blue Bridge and I think I have it done. Here's a screenshot of it, the site won't let me upload the file so let me know if you would like me to send it to you some other way. I understand you're busy so no rush.